FAO encourages reproduction and dissemination of material in this information product. Non-commercial uses will be authorized free of charge, upon request. Reproduction for resale or other commercial purposes, including educational purposes, may incur fees. Applications for permission to reproduce or disseminate FAO copyright materials, and all queries concerning rights and licences, should be addressed by e-mail to copyright@fao.org. This edition of The State of the World’s Land and Water Resources for Food and Agriculture (SOLAW) presents objective and comprehensive information and analyses on the current state, trends and challenges facing two of the most important agricultural production factors: land and water. Land and water resources are central to agriculture and rural development, and are intrinsically linked to global challenges of food insecurity and poverty, climate change adaptation and mitigation, as well as degradation and depletion of natural resources that affect the livelihoods of millions of rural people across the world. Current projections indicate that world population will increase from 6.9 billion people today to 9.1 billion in 2050. In addition, economic progress, notably in the emerging countries, translates into increased demand for food and diversified diets. World food demand will surge as a result, and it is projected that food production will increase by 70 percent in the world and by 100 percent in the developing countries. Yet both land and water resources, the basis of our food production, are finite and already under heavy stress, and future agricultural production will need to be more productive and more sustainable at the same time. A major objective of this publication is thus to build awareness of the status of land and water resources, and inform on related opportunities and challenges. Across the years, FAO has established itself as a unique source for a variety of global data on land and water. 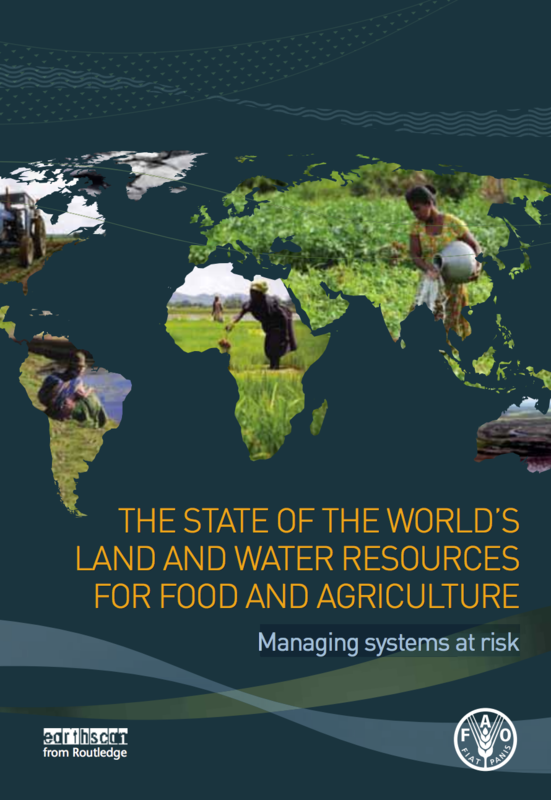 These data have been fully exploited in the preparation of this book, presenting the most comprehensive and up-to-date global overview of the availability of land and water resources, their use and management, as well as related future trends and developments. This further takes into consideration major drivers of global change, including demands driven by demographics, changing consumption patterns, biofuel production and climate change impacts.